Check the directions for the Fry's Electronics, Sunnyvale east side parking lot. Our next Electronics Flea Market is scheduled for April 13, 2019. We have signed a new agreement with Fry's Electronics to hold the 2019 Season of the Flea Market in the Fry's Sunnyvale parking lot. This is the same location as last year. We thank Fry's Electronics for their support of the Electronics Flea Market. ASVARO and the Electronics Flea Market are now on Facebook. Check it out our FB Page and give us a “like”. 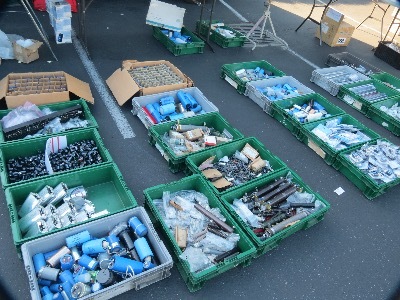 The location for the Electronics Flea Market is the Fry's Electronics, Sunnyvale east side parking lot. The Electronics Flea Market “swap meet” is held on the second Saturday (pre dawn) of each month, March through September (schedule) (flyer [PDF]). 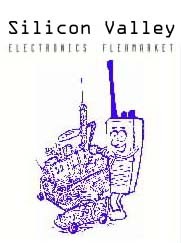 The flea market is organized by ASVARO for the benefit of non-profit amateur radio organizations in the Silicon Valley. Buyers enter the market for free and there is ample free parking available in the Fry’s Electronics parking lot and nearby street parking. Be sure to only park into properly marked parking spaces, observing no parking zones, handicapped parking spaces, and keep clear of walkways and traffic lanes. Use of handicapped spaces require a permit. Watch out for pedestrians. The seller/vendor fee is $30 per standard vendor space (2 adjacent parking spaces). Please bring correct change to speed your entry into the market. This swap meet has been a staple of Silicon Valley Amateur Radio since the 1970's. Held at Foothill College in Los Altos Hills. Held in north Sunnyvale near where the “blue cube” (Onizuka AFB) used to be located. Held at De Anza College in Cupertino for 12 years. Held at Fry's Electronics in Sunnyvale. The organizations that participate in the flea markets are active in amateur radio education, emergency communications, and civic support activities. If you would like to receive a reminder of each month's flea market and other news about the market, sign up on our email list. The Electronics Flea Market is held on the second Saturday of the month and focuses on electronics and amateur radio gear. Sellers pay upon entry on a first-come first-serve basis. More details are below. California law prohibits dumping of electronics and batteries into the trash. Flea market sellers are expected to leave their areas clean when they depart. Take your unwanted electronics to a recycling center for proper disposal. Saturday May 11 Flea Market - Hosted by Santa Clara County Amateur Radio Association. Saturday June8 Flea Market - Open for a new host. The flea market closes at 12:00 Noon. All sellers must be off the property by 2:00 PM so the cleanup crew can clear any remaining trash before they leave the site. Flea markets are held rain or shine. Rain during the flea market season is typically intermittent and we still receive significant attendance. The market opens around 5:00am and closes at 12:00 Noon. Sellers must pack up and leave the property by 2:00PM. Seller fee $30 for two consecutive parallel parking spaces (between chalk marks) which is enough room to park your vehicle and have space to display your goods. Additional spaces may be leased at $30 for each additional pair of consecutive parallel spaces. There are a few spots that are 3-spaces wide that are available for $45. Locations are on a first-come first-serve basis and the fee is collected upon entry. Sellers must register with form CDTFA-410-D upon entry to the flea market as required by the California Board of Equalization. Flea Market closes at 12:00 Noon and sellers must clear the property by 2:00PM so the cleanup crew can clear any remaining trash before they leave the site. The market closes at 12:00 Noon and all sellers must clear the property by 2:00 pm. Sellers at the Electronics Flea Market must be registered before entering the flea market. See Seller information for details. Ordinary Trash and Recyclables must be disposed of in the proper bins on site. Please, put ordinary trash in the trash cans. Place plastic bottles and metal cans into the recycle cans. All other waste including eWaste, hazardous waste, and cardboard must be removed from the property. Don't leave trash or recyclables lying on the ground. Take your electronic recyclables to a recycling center. Cardboard may not be left at the flea market site. Take all your cardboard with you and recycle it. No Toxic Waste may be left at the flea market or in the trash. This includes: Batteries, Fluorescent lights, Electronics, Computer or Television Monitors, or electronics components. See our recycling page for information on what to do with recycling and disposing of toxic waste. Dogs on Leash Only. Sunnyvale City ordinances require all dogs to be on a leash. Each owner is responsible their animal, maintaining control and cleaning up after it. No firearms are allowed at the flea market. No alcohol, nor illegal drugs, nor smoking are allowed at the flea market. No unauthorized food/beverage sales. No food sales allowed at the flea market except for the organizer's concession stand. Please, no adult material. The market is frequented by teens and families. ASVARO retains the right to revise it rules for the market from time to time without specific notice. ASVARO and its agents retain the right to refuse entry to, or expel, anyone who does not abide by the rules or otherwise causes disorder for the market. All participants are expected to comply with all applicable laws, including the collection and payment of taxes. Please properly dispose of trash and recyclable items. There are trash cans on the property for ordinary trash. California law prohibits the dumping of electronics including computer monitors and television sets into the trash (they contain large quantities of toxic lead). Violators will be ejected from the market and banned from future flea markets. You can find out more about recycling at RecycleWorks (San Mateo County) or ReduceWaste (Santa Clara County). Consider taking your electronic recyclables to a recycling center. ASVARO is a California non-profit public benefit educational corporation (501(c)(3)). 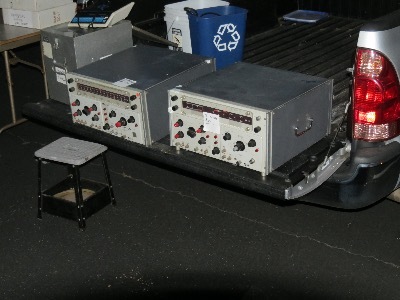 The Electronics Flea Market is operated for the benefit of non-profit organizations in the Silicon Valley. All net proceeds from the market are used by these organizations to carry out their non-profit activities. Thanks to Rick, WB5VUL for his many years of supporting the Electronics Flea Market and this web site! The Electronic Flea Markets are managed by ASVARO. Questions or problems regarding this web site should be directed to webmaster AT asvaro.org. Copyright © 1997-2018 All rights reserved.